Mothering Sunday is for many people a challenging and painful day. In acknowledgement of I have collaborate with the artist Rachel-Ann Powers to create a space in the St. Nicholas Chapel at Lancaster Priory where the absences, lossed and longings experienced around the day can be acknowledged and held. Dorothy's Room and the Women's Walks to Remember: 'With Memory I was there' booklets I have been creating are being shown as part Lancaster Arts new Move Exhibition. Move opens at 6pm tomorrow at the Peter Scott Gallery, Lancaster University and runs from 8 February to 22 March 2019. My work will be shown alongside that of the artists Kathy Hinde, Hannah Catherine Jones, Simone Kenyon and Jen Southern whose work also connects with travel, finding our ways and routes through places and history. Move comments on the natural world and landscape linking to ancestry, cultural reparation and the powerful nature of memory. Louise's presentation explores the ‘Lives of Others’ theme from her perspective as an artist and researcher who creates walking-performances in rural landscapes that emplace, re-image and transform ‘missing’, marginal and challenging life-events. She discusses how her work has addressed terminal illness, death and bereavement, infertilityand biological childlessness, coping with change and the effects of ageing. Into The Mountain: A Meet brings together practitioners and enthusiasts interested in the intersections and conversations between the arts, dance, mountain and hill walking cultures. Together we will critically explore through talks, discussions and sessions, how women+ encounter and engage with mountainous environments, considering both historical and current perspectives of gender in relationship to landscapes. We will also delve into the entanglements between dance, mountaineering, contemporary feminist writing, science and multiple arts practices. 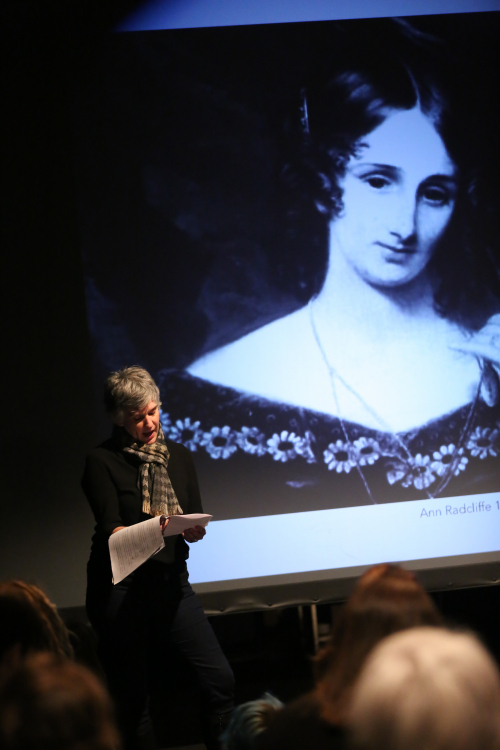 In her presentation Louise shows how the writing of the Dorothy Wordsworth and her female contemporaries, including Charlotte Smith and Ann Radcliffe suggests a feminine 'material' sublime ‘mode’ of engaging with landscape that enabled them to see afresh ‘everyday’ objects, people and experiences (including their own) that were ordinarily overlooked or on the edges of social and cultural discourses. 200 years ago, on October 7 1818, Dorothy Wordsworth and her friend Mary Barker climbed England’s highest peak: Scafell Pike. Dorothy’s account is among the earliest surviving accounts of the feat, and was a pioneering event in the history of women’s mountaineering. At this event, we will premiere a short film created as part of the project This Girl Did: Dorothy Wordsworth and Women’s Mountaineering by the award-winning filmmakers Jago Miller, Richard Berry and Ben Barden, in collaboration with Cumbria-based artist Alex Jakob-Whitworth, the Wordsworth Trust and academics from Lancaster University. The film interweaves a performance piece by Jakob-Whitworth that reimagines Dorothy’s ascent of Scafell with details from Dorothy’s account of the excursion and research on Scafell Pike’s cultural history. Alongside the film première, this event will feature talks by Joanna Taylor (University of Manchester) on the history of Dorothy’s climb, and Alex Jakob-Whitworth and Louise Ann Wilson on their creative responses to Dorothy Wordsworth’s legacies for walking practices. Louise's presntation looks at Dorothy's Room and Women's Walks to Remember: "With memory I was there." 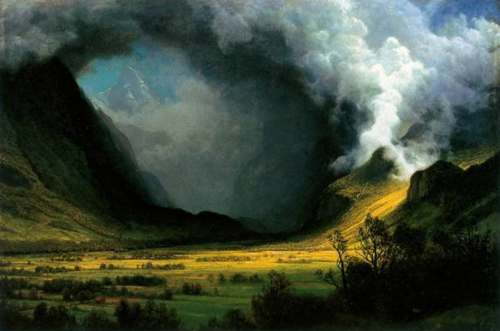 Performing Mountains: How Do Artists Touch the Void? Film and literature have always been wedded to the mountains but what about the other arts? How have theatre makers, land artists and scenographers interpreted mountains, using the impact of live performance on an audience? What does an artist see in the mountains that the rest of us don’t and how do they reach out to us to share their visions? This panel of contemporary theatre and arts practitioners, chaired by author of Performing Mountains and Leeds University Professor, Jonathan Pitches, sets out to answer those questions in discussion with internationally renowned playwright, David Greig (Touching the Void and Pyrenees) artists Rob and Harriet Fraser (Somewhere-Nowhere) and designer and theatre maker Dr Louise Ann Wilson (Fissure, Warnscale, The Gathering/Yr Helfa). 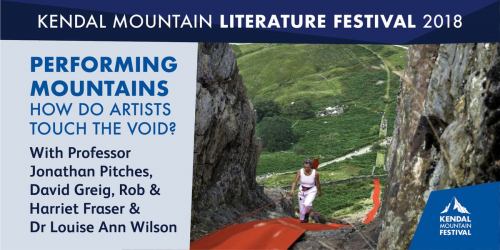 Louise's paper entitled 'Materialising The Void: A feminine sublime approach to mountain walking-performance' explores her use of mountains in her work. On entering The Priory, visitors were given a red card, bearing the name of one of the 6,500 men from the Kings Own Lancaster Regiment who were killed. Each cards was placed in the church, ‘spilling out like rivers all around The Priory’ as one visitor put it. 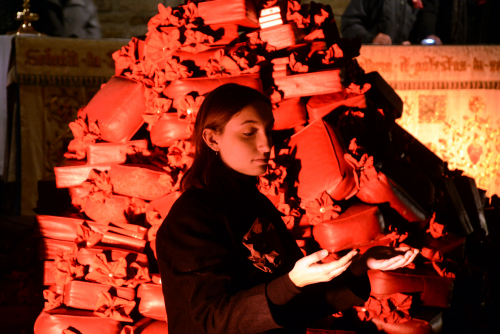 A mound of red prayer kneelers and prayer books interlaced with 2,000 hand-made red paper roses was built in front of the altar. A film of the Regiment leaving Lancaster was layered with the two photos of the bell ringers and projected onto an empty chair. The sound of larks and distant church bells hung in the air. Women of the congregation played the part of women who have yearned for their lost loved ones. They adopted stilled gestures taken from a painting of the Last Supper in the Priory, then moved silently to gather at the altar. Meanwhile, the choir sang Rosenberg’s poem Returning, We Hear The Larks set to music by Don Gillthorpe, the Priory Director of Music. 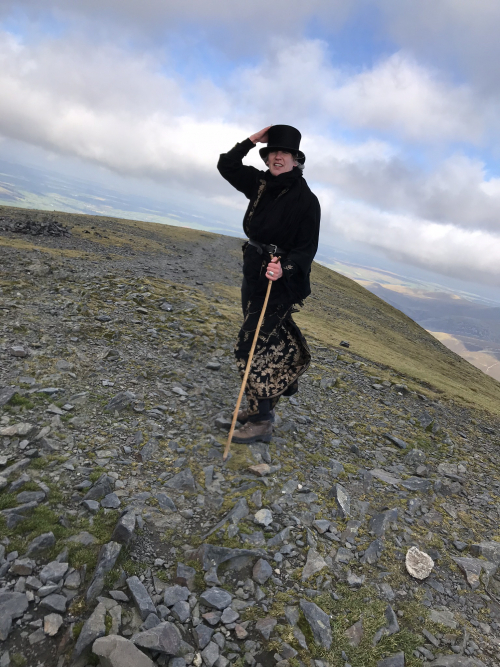 On 29 September I took part in a re-creation of a walk up Skiddaw undertaken by friends of Dorothy Wordsworth 200 years ago. 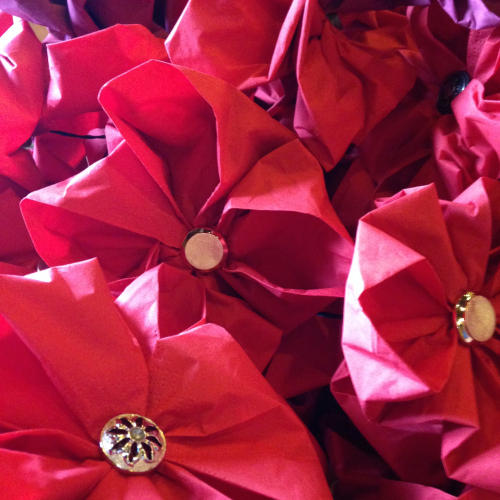 If you would like to be involved in the making of 2,000 paper roses for the Remembrance: 'Returning We Hear The Larks' installation, please join Louise and a team of makers on 13 and 27 October (11.30am.–2pm.) in the refectory at Lancaster Priory. This work will mark the centenary of the end of World War One, and reflect on lives changed forever by that conflict and the loss of those who never returned home to Lancaster. Remembrance: 'Returning, We Hear The Larks' will use artefacts and objects found in and associated with Lancaster Priory in combination with a paper installation of red-roses to create an immersive candle-lit performance-installation involving singers from the Priory choir. Women’s Walks to Remember: "With Memory I was there" is inspired by Dorothy Wordsworth’s Rydal Journals in which she describes “rural sights and sounds” in vivid detail and recollects the landscape and walks she was no longer able to do. It recreates some of Dorothy Wordsworth’s walks and walks that present-day women in the Lake District can no longer do. Louise has been re-walking each remembered walk and gathering together ‘treasures’ – hand drawn maps, words, objects, photos – to share with each of the women. 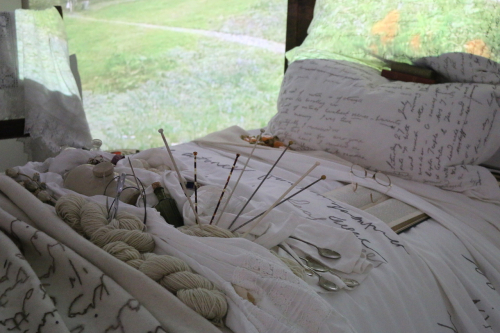 These items are currently displayed in the gallery at the Wordsworth Trust Museum together with the original art works that she is developing to reflect her experiences of meeting and walking for these women and Louise's installation entitled Dorothy's Room. Eventually, Dorothy’s walks and those of the present-day women are being mapped to create a network of ‘Women's Walks to Remember’. 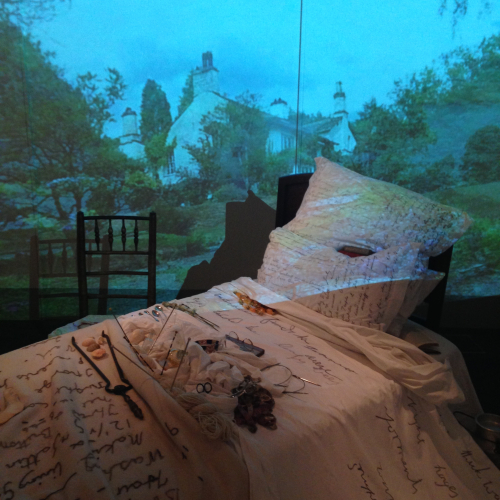 Dorothy's Room is now OPEN at the Wordsworth Trust Museum as part of Louise's Women's Walks to Remember: With memory I was there' exhibition. Please click here to watch a film of Louise in conversation with Melissa Mitchell, curator at the Wordsworth Trust, about Dorothy’s Room and Women’s Walks to Remember: 'With memory I was there'. 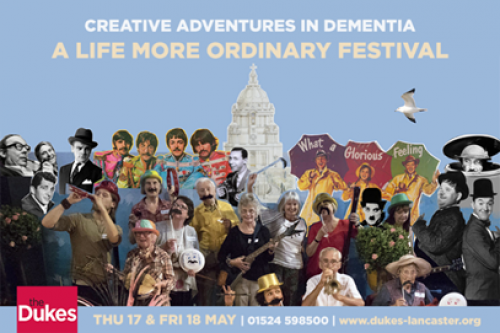 Mapping Workshop (Walks to Remember) with Louise Ann Wilson at the Creative Adventures in Dementia Festival. In these practical and creative ‘mapping’ workshop participants used simple drawing and writing processes to remember a walk that is significant to them. Over the duration of four-sessions a wonderful collection of very personal maps were created and displayed in a small exhibition. Louise is currently exhibiting photogaphs in the “UPCYCLE RECYCLE” exhibition. The limited edition photographic-images in this collection, entitled Close-up Clough Pike – were taken at Clougha Pike near Lancaster in Spring 2018. 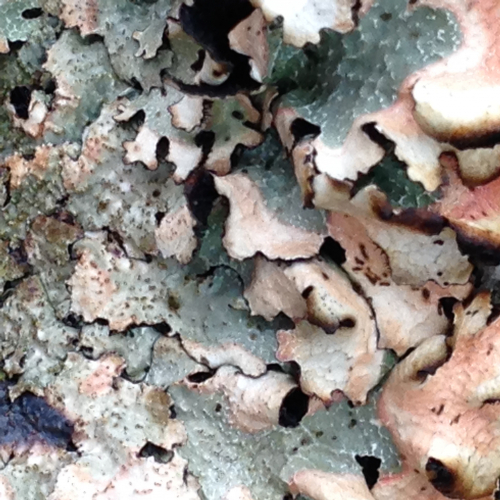 They capture the unique colour, texture and form of the lichens growing on the rocks found there. At Fertility Fest 2018 Louise is talking on two panels: There’s More To Life Than Having Children and Men Have Infertility Too. On the second panel she will be talking about a version of Warnscale that explores the male experience of in/fertility and biological childlessness that she is looking to create. Click here for details. Fertility Fest 2018 will feature 150 artists and fertility experts in a week long programme of events, entertainment, discussion, debate, support and solidarity about how the human race is being made (and sometimes not being made) in the modern world. 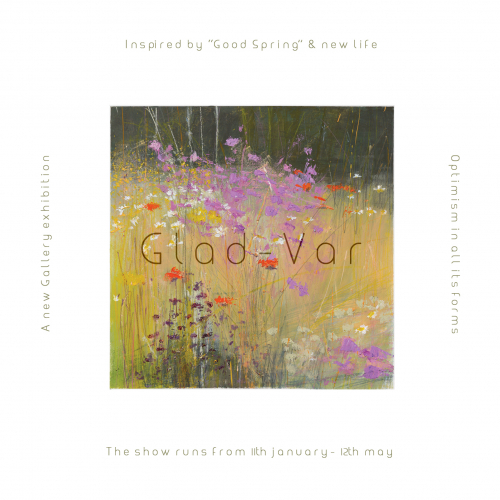 Louise is exhibiting watercolour paintings from the series entitled 'Petra' (rock/stone) in the exhibition “GLAD-VAR”. Louise's paintings are site-specific and focus on capturing and evoking the essence, feel, colour and form of: rural landscapes and topography; objects such as rocks, lichen and flora; weather and seasonal variations. She works in paint, pencil, print (often taking prints and rubbing on site)and mixed media montage often using a combination of images, words, line, fragments, texture, colour and white or “silent” space to create her artworks. As well as capturing and investigating a site her work can be used as an aid to reflection or meditation. The watercolours in this exhibition were painted on the Greek Island of Patmos in summer 2017 and seek to capture the unique colour, texture and form of the stones or ‘petras’ I found in the coves. Louise's presentation is published in the Online Publication from the two-day symposium, which drew together artists and thinkers from a wide range of disciplines to explore ways in which landscape –– and the ways we represent it –– connects deeply to our lives and underpins our relationship to the world. Louise's presentation focuses on Warnscale, a self-guided walking-performance specific to the Warnscale fells south of Buttermere Lake, Cumbria. Mediated through a multi-layered walking-guide/art-book, the walking-performance is aimed at women who are childless-by-circumstance. Society offers no rituals or rites of passage through which women who have ‘missed’ the life-event of biological motherhood can be acknowledged and come to terms with that absence. Warnscale, however, offers imaginative and creative ways through which participants can engage with landscape in order to reflect-upon, re-image and transition (even in the smallest of ways) the liminality that this circumstance can lead to. The paper explores how Warnscale was developed through: an in-depth, ‘situated’ study of the landscape in which it was created; observational research in fertility clinics; and a close reading of the journal writings of Dorothy Wordsworth. Dorothy Wordsworth’s Grasmere Journals describes how she walked in, and engaged with, the landscape in a manner that was embodied, multi-sensory and materially specific – a mode, I suggest, that can be understood as a form of the ‘feminine sublime’. This sublime, Louise argues, can also be located in her ability to notice the ‘common-place’ and thus see afresh ‘everyday’ objects, people and experiences that are ordinarily overlooked, or on the edges of social and cultural discourse. Warnscale works with an applied use of Wordsworth’s ‘feminine sublime’ mode of walking, dwelling and noticing and is framed by extracts from her journals. Exhibition: Using texts, photographs, drawings, mapping-walk maps and artefacts this exhibition shows how Warnscale mobilised 3-tiers of research that involved an in-depth study of the landscape in which it is situated, observation field work in fertility clinics, and a series of group and one-to-one mapping-walks with individuals affected by biological childlessness. The exhibition also shows how a close reading of the journal writings of Dorothy Wordsworth who walked in and wrote extensively about her experience of the landscape of the Lake District, informed Warnscale and its desire to engage the reader/walker in new, or different, ways of seeing and feeling the landscape and through that embodied, creative and immersive landscape experience transform their experiences of the underlying subject matter. 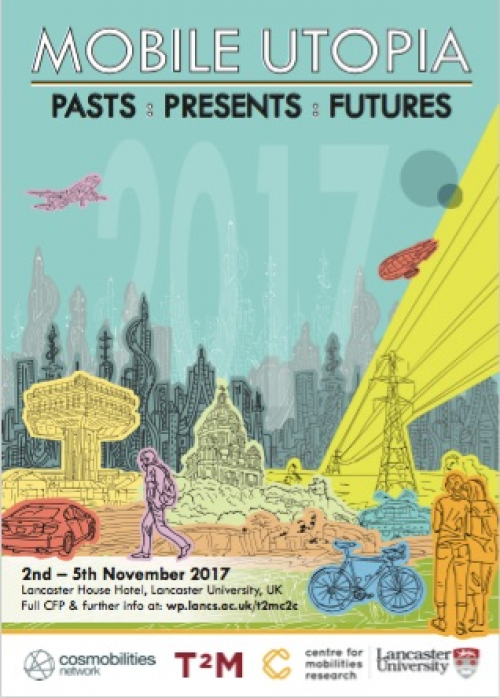 Exhibition catalogue: Mobile Utopias: Art and Experiments (2017). 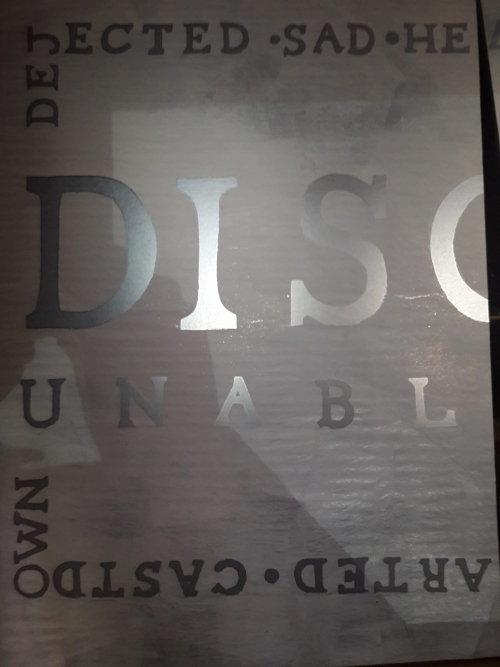 ISBN: 978-1-86220-3339-6. Louise's paper explores how rural landscapes can become a ‘site of transformation’ where ‘missing’, or challenging, ‘life-events’ are emplaced, re-imaged and transformed. The paper case studies (Warnscale) (2015-ongoing) and explores how, in Warnscale, the landscape and the act of walking and dwelling becomes a transformative metaphor for the underlying subject matter and applies theories relating to therapeutic landscape and mobilities. 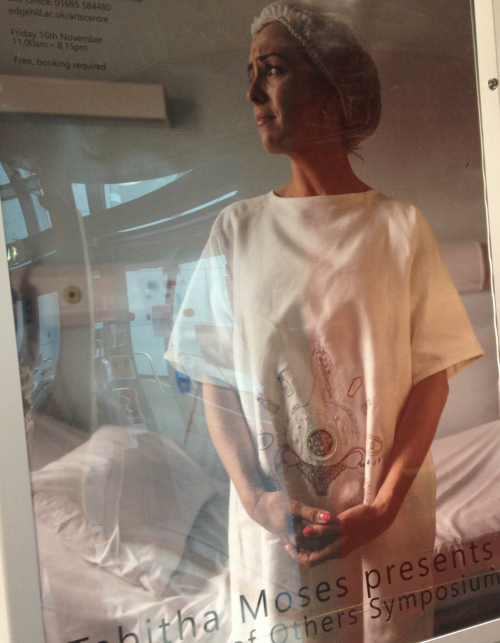 It articulates how Warnscale was created through three-tiers of research that mobilised the site, the science of the underlying subject (in/fertility) and, through a series of group and one-to-one mapping-walks, individuals affected by biological childlessness – thus challenging and re-imaging the normative ‘utopias’ around biological motherhood. The paper, analyses how Warnscale evolved and applied a series of six scenographic principles. These principles were informed by theories and aesthetics relating to landscape, pilgrimage, Early Romanticism, and a close study of Dorothy Wordsworth’s, and her contemporaries’ approach to landscape. The mobile, embodied ‘mode’ of engaging with landscape that these women pursued enabled them to see afresh objects, people and experiences that were ordinarily overlooked – thus producing a materially specific ‘utopia of the everyday’ – that articulated non-mainstream ‘lived’ experiences and discourses on landscape, and can be mobilised as a creative strategy in contemporary socially engaged performance practice. 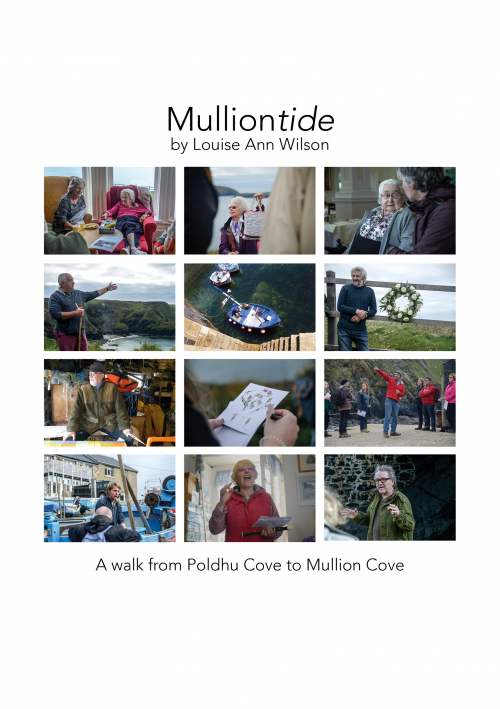 Mulliontide is a coastal walk from Poldhu Cove to Mullion Cove that Louise created in 2016 in collaboration with residents of Mullion, Cornwall. The walk notices the effects of tide and time, acknowledges deep feelings for place and recognises the challenges of change – personal and topographical. Those who did the walk over one weekend in October 2016 responded so positively that Louise has produced a special guide book so that others can share the experience. The walk takes you along the coast stopping at fifteen stations en route. The stations introduce you to residents who tell you what is important to them about that place. Each of these residents has deep feelings for this coastal landscape and knows it, and its constantly changing nature, intimately. The guide book invites you to get to know these people through their words, photographs and songs and to immerse yourself in the place through your own actions. Even if doing the walk itself is not feasible, this publication will provide you with a striking record of my most recent work. Mulliontide is a sited-walk from Poldhu to Mullion Cove, The Lizard, Cornwall. Evolved in collaboration with local residents, the walk focuses on a much-loved coastal landscape and explores the places where land, sea and people meet. It notices the effects of tide and time, acknowledges deep feelings for place and recognises the challenges of change. Moving from station to station along the coastal path, the walk invites participants to notice specific landscape features and layers them with memories, photos, songs and actions in order to think about belonging, loss and repair. The walk is a time for joining together to celebrate and reflect. Please note: Mulliontide starts at Poldhu Cove at 10am. It follows (and leaves) the coastal path, covers approx. 2 miles and will take up to 3 hours to complete including stops and lunch. Afterwards, we will return walkers to any cars at Poldhu Cove. The walk has ascents and descents, is rough in places and crosses wet and uneven rocks (with care). We suggest, therefore, that Mulliontide is not suitable for children under 14 or those unused to walking on rough paths. Mulliontide is part of the project Miss You Already produced by Golden Tree Productions. It is funded by the National Trust, The Exchange, the University of Exeter and supported by Hall for Cornwall.